An easily assembling light bulb socket as disclosed secures a light bulb in a single clicking action. The disclosed socket comprises an electrically conductive sleeve configured to clasp a threaded end of the light bulb. The sleeve comprises a bump configured to slide into a thread recess and click-secure the bulb in the sleeve. A first disk received into the socket is riveted to the sleeve and to a metallic ribbon. The sleeve rivet makes a connection with a first wire and the ribbon rivet makes a connection with a second wire. The socket additionally comprises a second disk defining two holes aligned with the rivet holes in the first to disk to receive a respective wire there through. The second disk holes include elliptical recesses configured to channel and secure the first and second wires between the disks when the second disk is axially rotated adjacent the first disk. Easy Socket One Corp, (ESO) is a company which has designed a safe and uniquely easy to use lamp socket now ready to be launched into the $100 Billion global lighting market. ESO can offer the global illumination market with a patented socket into which a screw bulb may be inserted into a stable connection with a power source without engaging the screws. ESO Safe Sockets will have customer appeal because they are safer and easier to use than screw sockets, especially with overhead lighting fixtures. The safety factor is important where incandescent and CFL light bulbs are being installed or removed. A traditional socket’s screws and those of the bulb may corrode and bond which will then require more torque force to turn the bulb. Too much torque force will break the bond between the glass part of the bulb and its metal base. This can cause broken glass injuries and, in the case of CFL, release Mercury into the environment. ESO 26/27 sockets greatly reduce this risk by having engineered a cleaner and smoother slip interface between the bulb and the socket. This kind of socket does not exist in anywhere in the world market. It is a practical innovation on a universally employed electrical device. Mr. Isaac Sanchez, President of ESO Corp, is the owner of the patent Number US 8,602,802 B2 dated on Dec 10,2013. Currently, ESO Corp, already has the molds made for ceramic and plastic lamp socket Models numbers ESO 26/27 and SS/26/27. These models work with American and European specifications, and they work with incandescent, LED and fluorescent bulbs 26mm and 27mm. 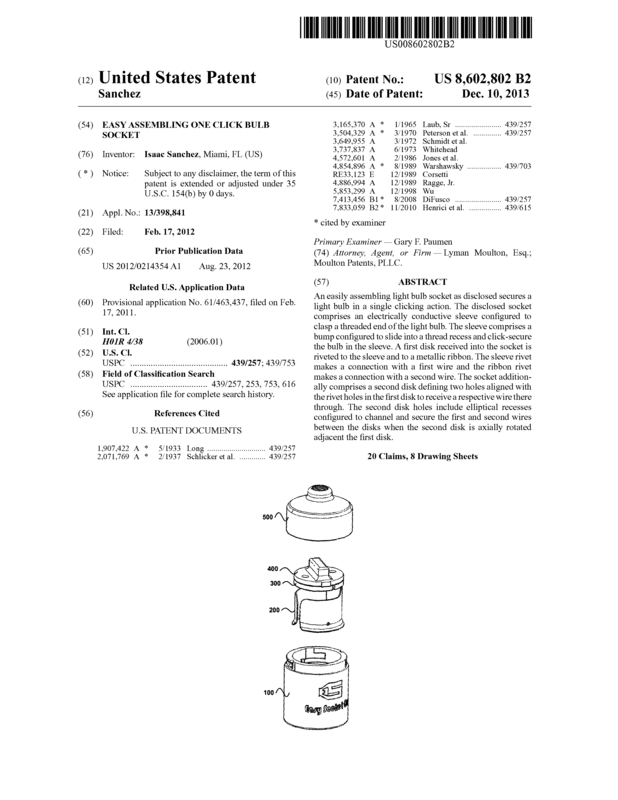 Page created at 2019-04-22 14:32:17, Patent Auction Time.